A collection of book reviews written by students in my reading class and by interested adults, including students in the college courses I teach. I read the book Love From Your Friend, Hannah by Mindy Warshaw Skolsky. When I read this book I thought it was the most interesting book I read all year. I think you should read this book because it’s about this little girl named Hannah Diamond that likes to read letters and write them. She wrote to President Roosevelt, her best friend Aggie, her teachers, grandma,….and Edward a guy she picked out of friend box. The friend box is where you pick a name and address and you become pen pals. Hannah has to write to her friend, Aggie, because she moved away from her. Hannah promised she would write to her but she broke her promise. Hannah wrote about 18 letters but she thought Aggie forgot about her. So at the end her friend Edward’s cow had a baby and Hannah and him became close so he named the baby cow Hannah. Hannah was so happy her best friend became Edward Winchley. Other students might want to read this book so they can understand how she writes to them and why she does and why she gets grounded. I thought that Junebug and the Reverend was a great book. I thought that the author and illustrator ALICE MEAD was great because she told about JUNEBUG and she made you feel like he felt in the book. The reason that I said that is because Junebug had to leave all of his friends to go to Chicago. When he moved he had met this man that worked on the boats and gave Junebug a job but, one day Junebug went down to work on his day off so the man that gave him the job told him to go home but he didn’t he went by the water, but he knew he couldn’t swim and then that’s when he fell right in the water! Next, in Junebug’s apartment building, a man that liked Junebug’s mom had a dad that really needed help with his smoking habit. Junebug was being a good friend. He would go on a walk with the Reverend so that he could live longer than he wants to that’s why he was going to buy him some cigarettes, but he didn’t know any better. I think the Indiana students might also enjoy this Junebug book because this book made me think different. You can do good things without being with your friends all the time. I hope you enjoy. Snail Mail No More is the best book I read yet. The authors of this book are Paula Danziger and Ann M. Martin. I think you should read this book. Once you start reading it you don’t want to stop. The book is mostly about these two girls, mailing each other back and forth. Then they both got computers. They started emailing each other at once. Elizabeth has a friend named Tara. She knew her for like ever. And they didn’t get to see each other in like a year. Tara had a little baby sister at first she hated it because it got more attention than she did. But now she is ok with it. They all worked it out, and everything was ok.
You should really read this book. There is one sad part but, after that you’re fine. This girl Elizabeth her dad dies in a car crash because he was a drunk. They all loved him, but they hated that he gets drunk and wants to come and see the kids. Elizabeth’s little sister, Emma, is only like five or six. And the dad sent the little girl, Emma, a big radio. The mom sent it back. Emma didn’t even know about it. Elizabeth and Tara were writing back and forth, talking about what is going on where they are. They talk about boys, and they talk about their life. But Elizabeth got a phone call. It was the police. They said that they needed to talk to the mother right away. She got her mom. Elizabeth’s mom got on the phone. They told her about the dad. Elizabeth’s mom just dropped to her knees. She just cried and cried. Elizabeth said, “What is wrong mom?” Her mom said, “Your dad died in a car accident.” Elizabeth just ran to her room and cried. Then she got on the computer and told Tara. Tara couldn’t see it happening like this. She said I’m sorry. I will be down there as soon as I can. They came down there. They went to the funeral. The mom just couldn’t stop crying. They all went home and Elizabeth tried to write a poem. But she couldn’t. Well they all worked it out. And every thing was going to be ok.
Freaky Friday by Mary Rodgers is the most hysterical book that I have ever read. I think you should read Freaky Friday because it made me laugh and I think that it could make you laugh too. When I read this book it felt like they were actually talking to me. When I read this book I was confused because Annabel turned into her mother so that freaked me out a little. Mrs. Andrews was now acting like Annabel so when Boris came over then he thought that Annabel’s mom was who he liked instead of Annabel. Annabel Andrews had a little brother named Ben but she calls him Ape Face and Ape Face really loves being called Ape face but he won’t tell Annabel that he likes being called that. Boris baby-sits Ben a lot when Mrs. Andrews is out or gone. This is something funny, Mrs. Andrews as Annabel is playing doc hockey with Boris and she wins. Boris asks who lives in there and Mrs. Andrews says that, that room is Ben’s room and it has a canopy bed and a dollhouse. This book was funny, mysterious and goofy. That is the kind of book that I read. I think you should read Diary of a Wimpy Kid by Jeff Kinney. A boy named Greg Heffley’s mom gets him a diary but he says this isn’t a diary, it’s a journal! During the whole school year he writes in the journal about all the problems he has in the school year like when the bullies beat him up. Rodrick is Greg’s older brother. He loves to torture Greg, like one time he had Greg get up really early on a Saturday morning and lied, and said it was a Monday morning he said he was going to be late for school. Greg also has a friend named Rowley. He some times gets on Greg’s nerves. On Halloween night he had went out with Rowley. He was mad, because his dad made him take his annoying little brother. Greg is a very creative person. One time he made weights out of old milk jugs and sand, and I thought that was a pretty creative idea. I think this is a really great book for kids, because I am a kid and I really enjoyed Diary of Wimpy Kid. This is also a great book for kids because it has a lot of comics and pictures. This is why I think you should read this book. When I chose Ghosts in the Gallery by Barbara Brooks Wallace, I thought that it was going to be good, but it’s really boring at the beginning. Ghosts in the Gallery is about a girl named Jenny. Jenny came from China and was sent to her grandfather. And her grandfather says he doesn’t have a granddaughter. It gets really better in the middle and at the end. There are a couple of mysteries in Ghosts in the Gallery. The mystery is about the pictures in the gallery (hall way). The Gallery isn’t haunted and doesn’t have ghosts in it. And there’s another mystery about Madame Dupray and the letters Jenny’s mom wrote telling them about their marriage and Jenny’s birth. Read this book to find out what Madame Dupray did with the letters. 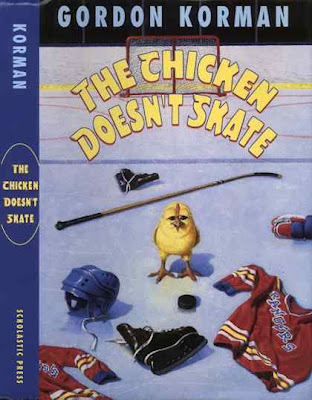 I thought The Chicken Doesn’t Skate was a funny book. Milo brought a chicken for the science project in the food chain. The whole class forgot that it was a science project, and that Milo was going to take the chicken and serve it to the judges. Everyone in the class treated her like the class pet. Zachary didn’t like the chicken but if Milo killed the chicken he will have dreams about Henrietta. Zachary thought that he was the only one that was going to take Henrietta and save her, but when Zachary got to the school no one was there so it was free and easy he thought. Zachary took the chicken. He heard something in the hall so he sneaked in the closet. Then he heard two people talk. “We know you’re there. Come out!” Then he didn’t do anything. He heard the door knob. Then once it opened there were two people standing in front of him. He saw Kelly Marie and Adam and they said, “Where is Henrietta?” Then Zachary said, “I got her. “Let’s get out of here before someone else comes.” Then they took her to Zachary’s house because if the cops were going to look for Henrietta they were going to go to Adam’s and Kelly Marie’s house first. So they left it in Zachary’s house because people knew Zachary hated the chicken. When Zachary took the chicken his little brother was looking at Henrietta and doing everything she did. Then since Zachary’s little brother always threw his toys and stuff at his computer Zachary got really good at stopping everything his brother threw at his computer. Zachary was trying to stop the toys and stuff because he was trying to become a famous writer. Read this book and find out if Milo makes Henrietta dinner. And will they find out who stole Henrietta? Book Review by Mrs. Locke, teacher, Washington, D.C. It was hard to choose just one book by Andrew Clements, as he is such a wonderful and fun children's book author. I chose Frindle because I just read it this summer so it is fresh in my mind, but also because one of my students read it over the summer and talked about it all the time in our penpal letters. (Yes, I was penpals with my students if they wanted to be). This book is about a boy with a terribly strict teacher, but the boy is always coming up with ways to distract and fool the teacher. The boy decides to prove a point to the teacher and gets the whole class to stop using the word "pen" and instead calling it a "frindle." This annoys the teacher to no end, but the word "frindle" catches on and soon, the whole school is using it and it becomes a big news story. Frindle is a fun read, and appropriate for 2nd through 6th graders. 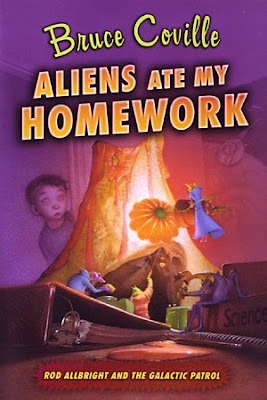 The book Aliens Ate My Homework it is a cool book. This kid is working on his project. Later he was working and aliens came. Well that freaked him out. Well then he was scared. Then the aliens came out of the ship. He was freaked out. Then Grakker, one of the aliens, came out and the kid was getting mad and kept on talking. Well then Grakker gets mad and points the ray gun at the kid. Then the kid freaks out, and it looks like he got his ears pierced. He does all kinds of missions for the aliens, if he didn’t, he would have to go to alien jail. He does all the crazy missions. Like one of these kids picks on him, but he is really an alien so the kid was freaked out so he had to do the mission or else. He does all the missions. He had to sneak into his house and get into his TV. He sees crazy stuff like fake people like his parents. He was scared doing it too. He skipped school too. There were cops at his house, and his mom was scared. She went looking for him, and then the bully at the school took his little brother and sister. He took them to this secret place in made a trade. Everything was safe and he gave up. Well the aliens and the kid went back to his house and the aliens started to eat his project. His mom was happy that he was safe. So that is the best story ever, so that is why I read that book. is a boy who likes to lie to get by with stuff. It all started back in 1st grade when Mark and Charlie said a story about if you put a toad in your mouth it will be magic. So Gilbert put the toad in his mouth. A teacher said “Get that out, Gilbert,” so he did and said “Charlie told me to” and Charlie said “But Mark did too.” The Teacher asked Gilbert, “Did he say that?” He replied yes he did. Charlie and his lies got him in great trouble. Find out what happens to Charlie by reading the story! Does he get rid of the skull, or have it forever? You should read Jeremy Thatcher, Dragon Hatcher by Bruce Coville because it’s a good book and it’s fun and funny. 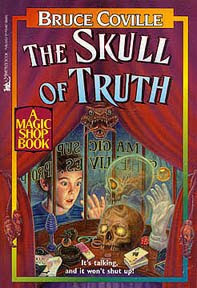 The adventure began when Jeremy Thatcher went into a magic shop and that’s when he saw a magic egg. It was so colorful. Jeremy wanted it but, what he don’t know is that he was on for a big surprise. Read this book to find out what happened when Jeremy took the egg home. You should read Nothing’s Fair in Fifth Grade, by slumber paBarthe DeClements. There was a new girl in school named Elsie. She was fat, blond and gross. Elsie’s mom said she couldn’t eat junk food. She did and she got yelled at. She couldn’t go to a rty, but then she did, because she told her mom that she was sorry for eating junk food. Then the principal and the teacher and her friends thought Elsie was stealing money. They went outside for recess and she went back inside and stole the money off the desk. Then she went to the bathroom and the teacher thought that she went outside, but then when the class came back, she went back in the line and pretended like she’d been there. Everyone went back in the class and everybody thought that she stole the money. You might like this book because it’s a good book. It’s like in 5th grade, and you might be in 4th grade getting ready for 5th grade, or you might already be in 5th. You might be scared going into the 5th grade and this book will get you not scared about going to 5th grade. 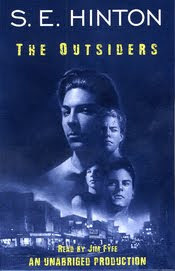 I read this book called The Outsiders. They had a enemy. They were the Soc’s. They had good cars. They had the girls. They had the money. They thought they were better than the Greasers. The Soc’s were always trying to jump them all the time. The Greasers had a fight in the park. One of the Greasers killed one of the Soc’s. The kid that killed that Soc his name was Johnny. He was always sad. He was always getting beat up by his dad. Nobody cared about him besides his friends the Greasers. Read this book to find out what happened. 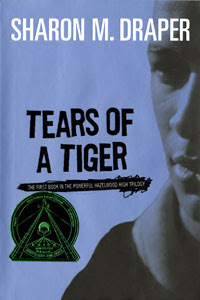 I thought that Tears of A Tiger was a good book because it was about these four boys: B.J, ROB, ANDY, and TYRONE. They are best friends and have been there for each other. Then one day they were in high school and went out to have fun an went to go get some brew which means beer. Tyrone, Rob, and Andy were drinking and B.J wasn’t drinking. Andy was driving. While they were out having fun they had got in a car accident. One of the boys died. I think you should read this book because it will give you a heads up in the real world. You should read When Zachary Beaver Came To Town by Kimberly Willis Holt, because it is a fun and cool book to read. The problems seem real like it could happen to anybody. The book is about a kid named Toby who has a lot of problems. He gets rid of his problems by the help of his best bud Cal. Like his mom becomes a big and famous country singer and never came back to town. Then the fattest kid in the world, Zachary, came to town. They become best buds. Then Zachary’s guardian leaves him in town. I think you should read Junie B. Jones Has a Monster Under Her Bed by Barbara Park because it talks about how Junie B. is scared of underneath her bed. So she tries to get her mother to look under her bed and see if there is a monster. Her mother doesn’t believe her. Neither does her dad. So she wanted to sleep in her mom and dad’s bed. And Junie B. won’t even close her eyes to go to bed because she thinks that if she closes her eyes, the monster might not be invisible and come true. So finally her dad looks under her bed and in her closet, in her drawers. Almost everywhere. Then Junie B. goes to school and gets her pictures taken by the cheese man. She didn’t like her pictures, so she went home after school, and put them under her bed and thought that the monster would be scared of her pictures and run away. But then her mom saw the pictures under her bed and bent over and looked at them and laughed. So did Junie B. Jones. Now she was happy that there were no more monsters. But, there wasn’t any to begin with. Junie B. Jones is a fantastic book if you want something funny to read. It made me want to read it and not put it down until I finished the book. This book will make you feel like you are a kid back in kindergarten. I thought Hatchet was a very good book. It starts by his mom cheating on his dad, so the dad moves across the city. He has to go to his dad’s house. Then he has to go to his dad’s for the summer. So he has to fly to his dad’s in a little plane. Then the pilot has a heart attack. Then the plane started to fall, and then he grabs the wheel. He starts to pull up. Then he lands in a lake. He is lost all alone. Will he live or be saved? You have to read it the book is by Gary Paulsen. I thought that Punished! By David Lubar was a hysterically funny book. Two boys go running into the library to do some research for a social studies project. While they are chasing each other, Logan runs head-on into a strange, old man in the basement of the library. The man says that Logan needs to be punished. At first, Logan doesn’t think anything happened. Then, when he starts talking to his friend, odd words start coming out of his mouth. The first thing he says to his rambunctious friend is “Will you please try to behave your shelf?” Later, he tells the librarian, “Eyebrows the books all the time.” Soon, Logan realizes that being PUNished means that he has been cursed to speak in puns. Imagine the scene in class the next day when he gets in trouble because his teacher thinks he’s being a smart aleck! Read this book to find out how Logan breaks the curse and begins to speak normally again. 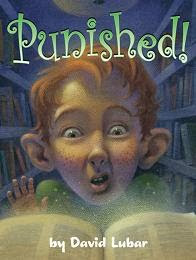 Indiana students might also enjoy Punished! because it is one of the nominees for the 2009-2010 Young Hoosier Book Award Competition. Students who read at least five of the twenty nominees are eligible to vote for the award-winning book in May.